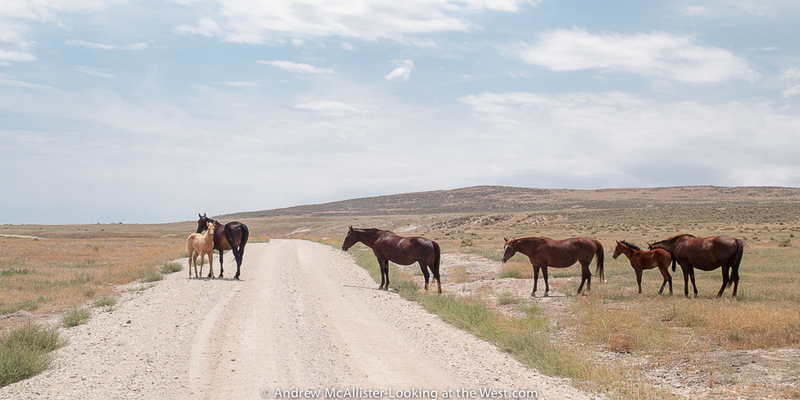 Once, when heading out to see Robert Smithson’s Spiral Jetty we came upon this family of horses grazing near the road. 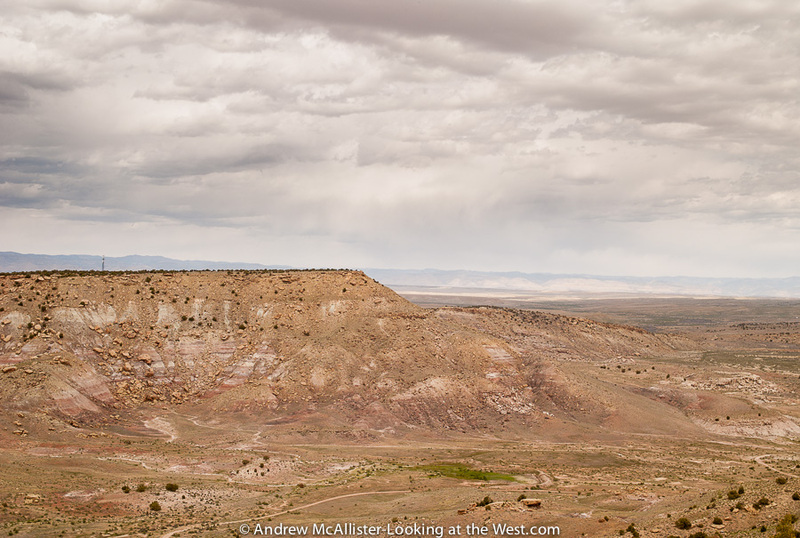 The landscape of Promontory is austere and so different from the I-15 area just 40 minutes away. 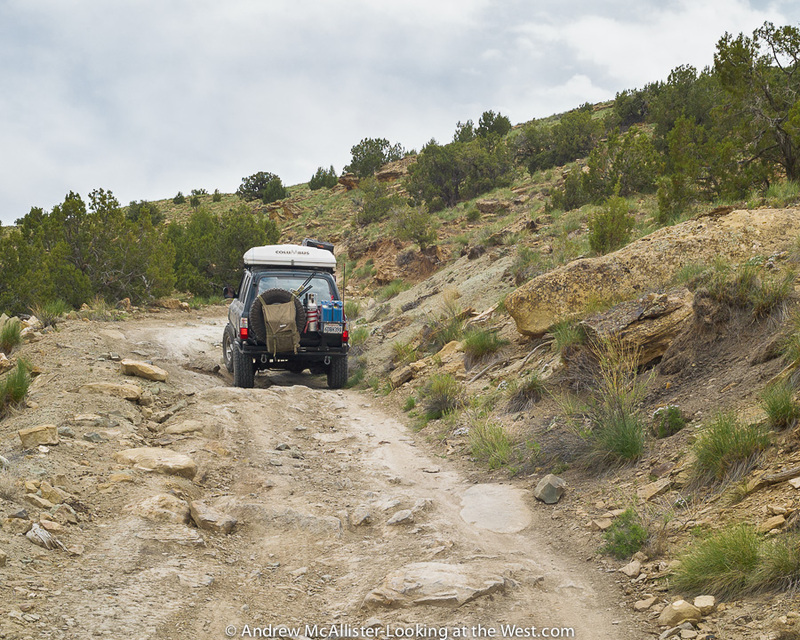 Locals will tell you that the road was much rougher in years past and had a few points where 4WD was required. 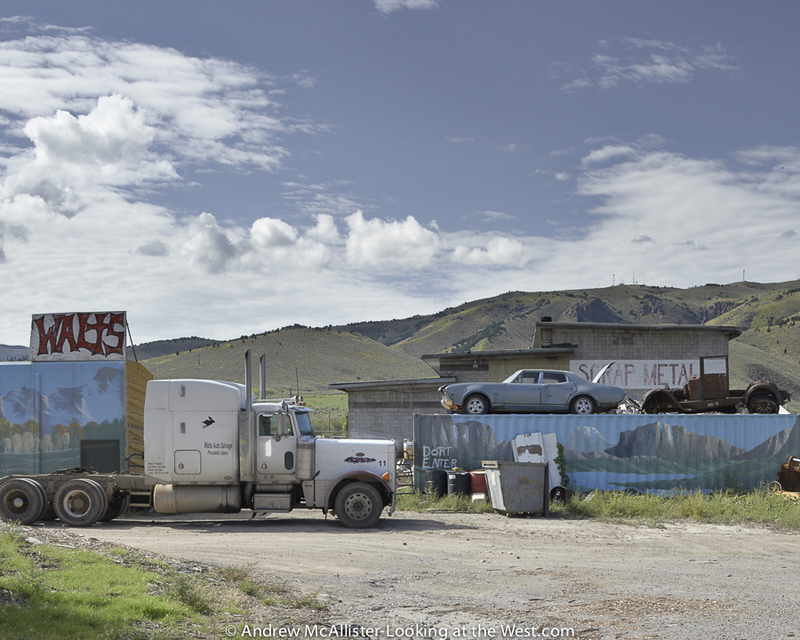 In my many trips out there I have seen Audi Coups, passenger vans and even a Kenworth. Follow the signs and drive sensibly and you will make it. 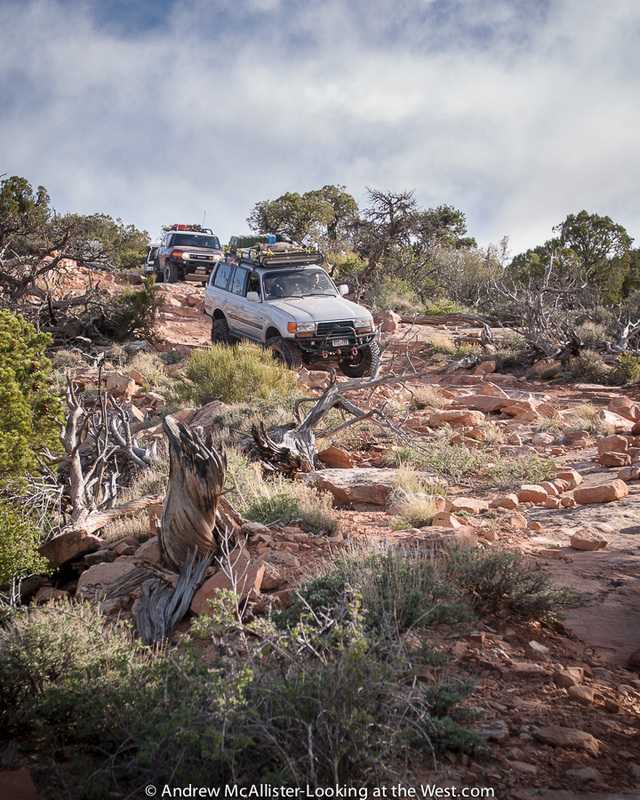 After the past few posts it’s time for a break from red rocks, blue skys and Toyota Landcruisers. 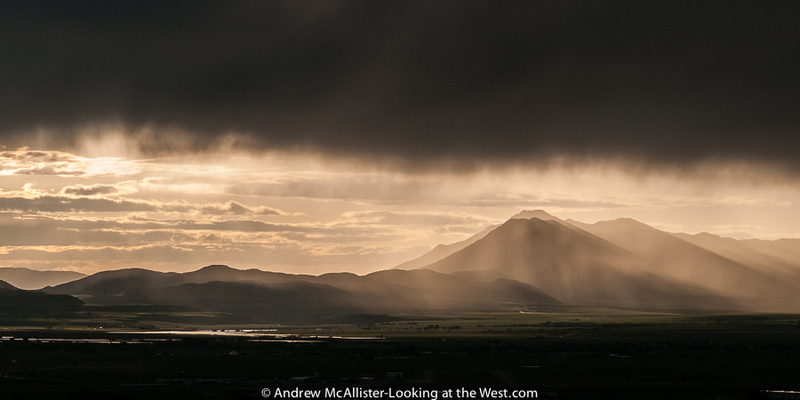 I’ll start with this image from the homestead in Cache Valley looking to Gunsight Peak some 23 miles away. 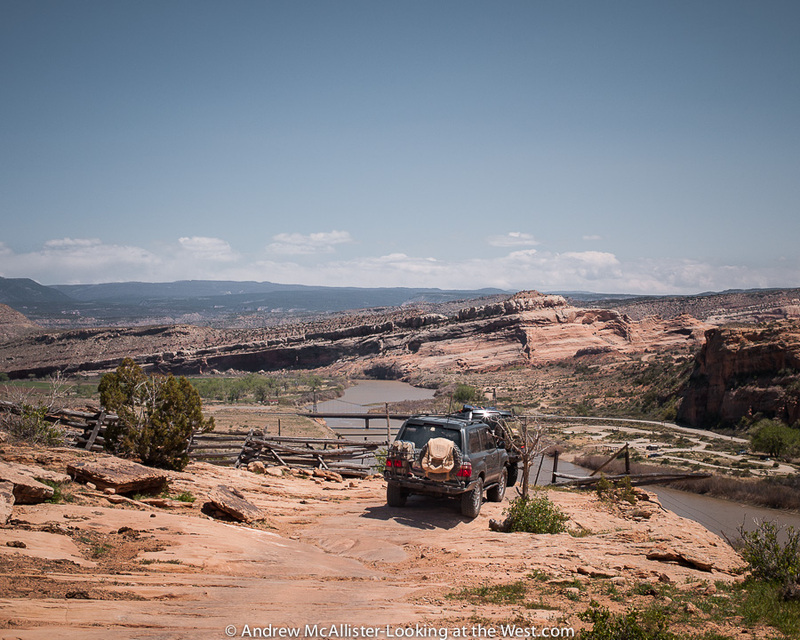 The third and final day of the 2013 Cruise Moab Kokopelli Overnighter. 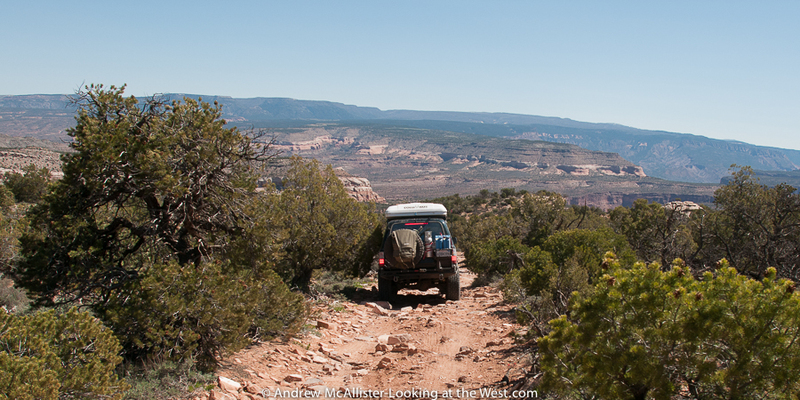 Today our group would drive Rose Garden Hill, Thompson Canyon and Polar Mesa and then into Moab. 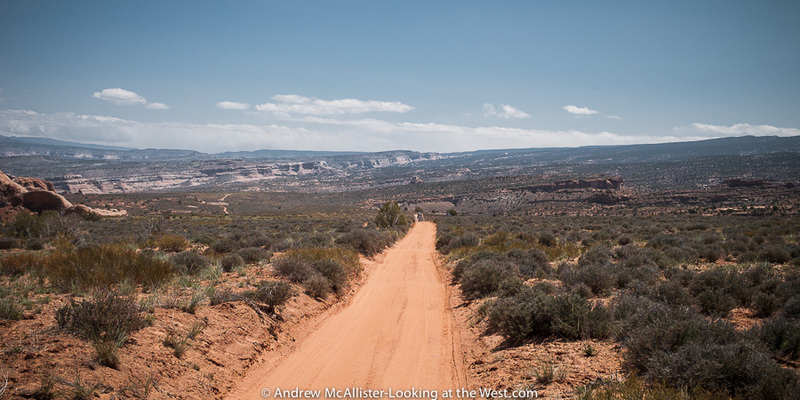 However Sean and I would have an unexpected twist in our journey and have to break off from the group and return to Moab via one of my favorite locations: Onion Creek Road. Above: My choice of camp spot (the blue tent) had me up early with the sun. Within an hour everybody was up and getting ready to go. Sean and the Dinoot trailer handle the first steep section with ease. This section of the trail had a few off camber climbs (above) before a long gentle descent (below). The tippy section of the trail. This was a somewhat easy section compared to the Rose Garden Hill section. The Fun Treks Guidebook states that this section pictured below can be tricky in wet conditions. Not a problem today but would hate to be out here in a downpour. Getting closer to Rose Garden Hill. The flat section below has a bit of a drop off on the drivers side. Just around the bend our group would stop for lunch and to assess the trail condition. A few jeeps were there when we arrived and we watched them struggle down the hill. Ace and Sandy spot Sean down the top section of Rose Garden Hill. Jonathan spots Sean through a particularly bouldery section (below). Jonathan spots Darius down a section of Rose Garden Hill. Sean returns the favor and spots our trip leader Jonathan down the hill. Jonathan and his family descending Rose Garden Hill with an Adrenalin Camper. 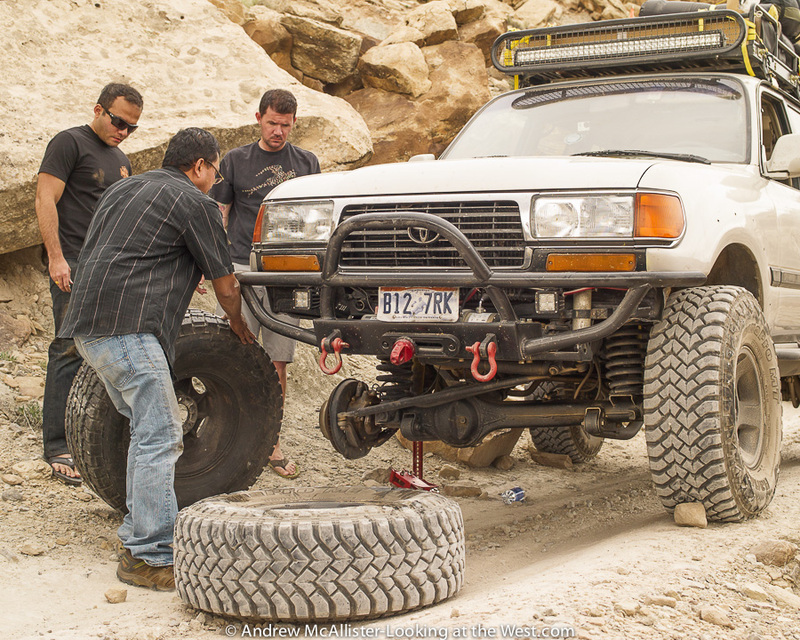 Check out the wheels on the LandCruiser. After all the vehicles were safely at the bottom and via the wonders of onboard refrigerator/freezers had an ice-cream snack before continuing on. After the break we headed toward Fisher Valley and Polar Mesa. After the Rose Garden Hill section we just completed the rest of the trip would seem like a cakewalk. After a mile or so of trail with inter dispersed rocks and curves the road straitened out as we approached Fisher Valley (below). 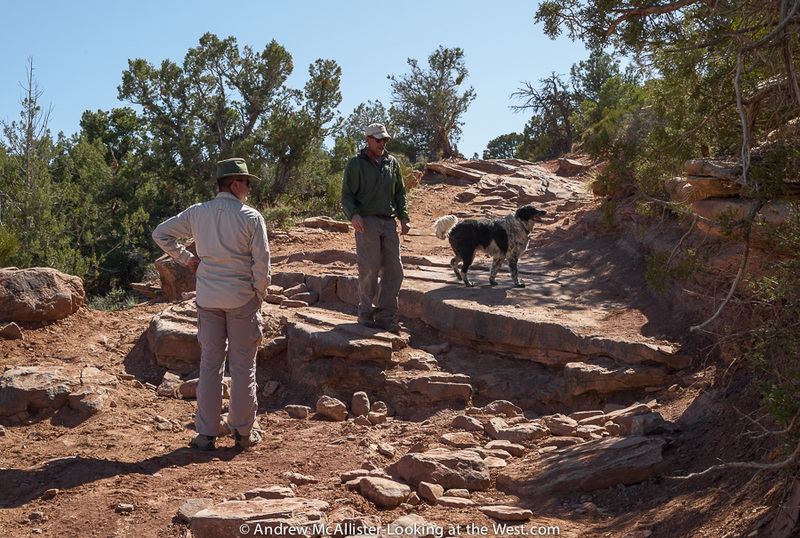 We would continue on through Thompson Canyon and up to Polar Mesa at a good pace stopping once for the group to catch up at an intersection before moving on. The combination of our pace and the fact that I had filled my camera’s cards resulted in no pictures from this leg of the trip. A good hour or so into this final leg of the trip when the group had stopped and Jonathan was talking to us Sean noticed his prescription glasses were missing. We searched the truck and the areas we had walked in to no avail. A decision was made to break off from the group and retrace our path in search of the lost glasses. We did not have many hours left of daylight so we made good time back to the places we had stopped. Nothing was found at the Fisher Valley intersection so back to the Rose Garden Hill it was. Not unlike finding a needle in a haystack, it was daunting to look up the bolder strewn hill and think they could be found. Long story short, Sean had remembered falling at a point about 2/3 the way up the hill and it was there that he found the glasses on a rock. He theorized that someone found them in the trail and set them on a rock out of harms way knowing that whoever lost them would eventually return looking for them. Pretty amazing that we made it back and found them with about 40 minutes of light to spare. So this 3 day Kokopelli Trail run with the Book Cliff Cruisers ended well with lots of adventure, new trail friends and a couple of stories. 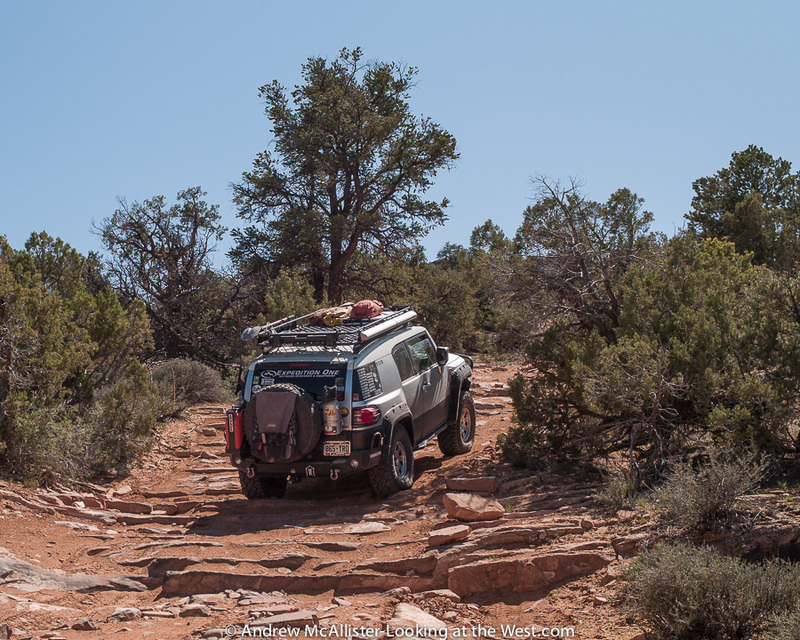 For me it was a great opportunity to see some new parts of Utah, learn about reading the trail and seeing where a well equipped vehicle can take you. 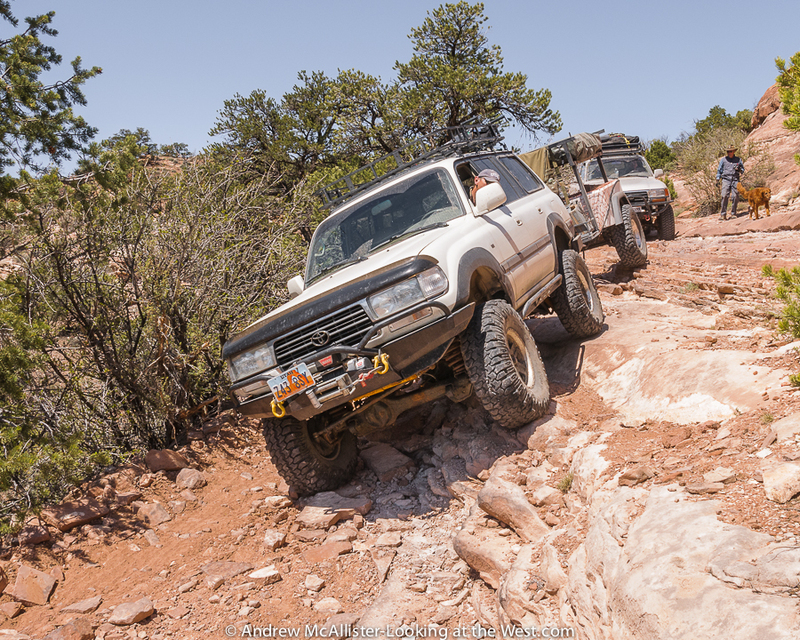 It also renewed my respect for the rugged landscape and those who cut the original trails, and was great to be apart of a group of drivers that followed the principles of tread-lightly and stayed on the established trails. 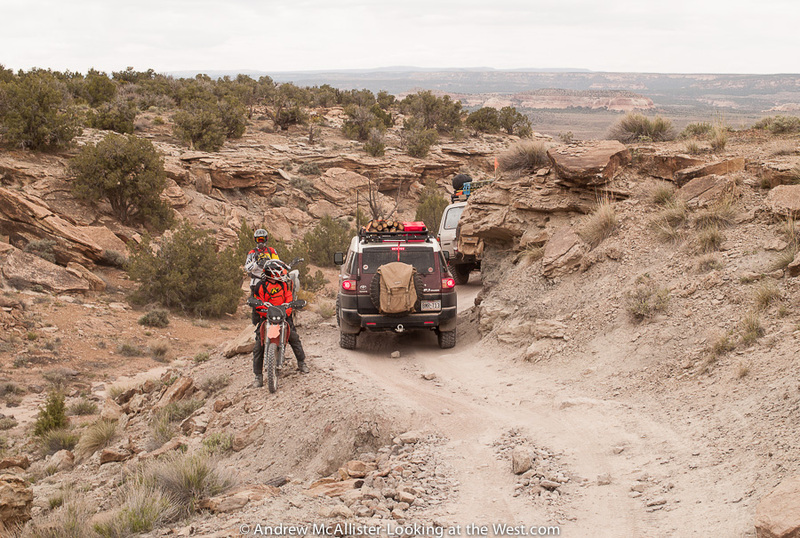 This year we are slated to do the San Rafael Swell overnighter and it looks to be quite an adventure through some beautiful, remote and rugged landscape. Naturally a blog post or two will be in the works. Day two of the Kokopelli Trail the most photogenic of the trip. 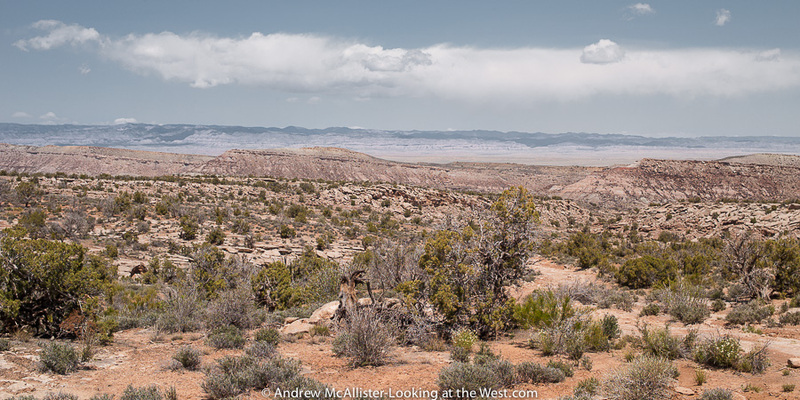 We crossed increasingly scenic landscape starting with the austere Cisco Wash followed by the increasingly rugged Owl Draw and Dome Plateau (pictured Below). The day concluded with the Top of the World trail that terminates at a rock ledge hundreds of feet above the valley floor. The view from the Top of the World trail terminus one can see Onion Creek and Fisher Towers below you, Professor Valley and the Colorado River in the distance and the ridge line of the windows section of Arches National Park some 15 miles away. After a hearty breakfast our group broke camp and headed for the trail for a long day in the saddle that would cross increasingly scenic territory. 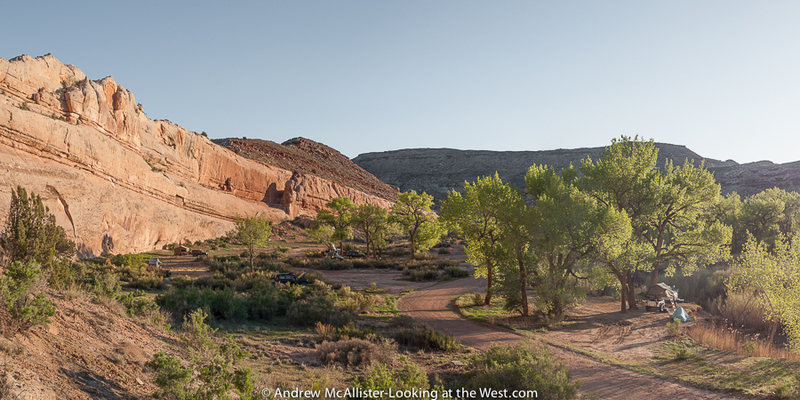 The first section took us from our camp at Fish Ford over to Utah 128 via a dusty two track that crosses Cisco Wash. Seeing the depth and departure angle of the wash I jumped out to get the shot above for Sean’s trailer review. Being in a wash like this one, I can understand why maps have warnings about roads being impassable when wet. 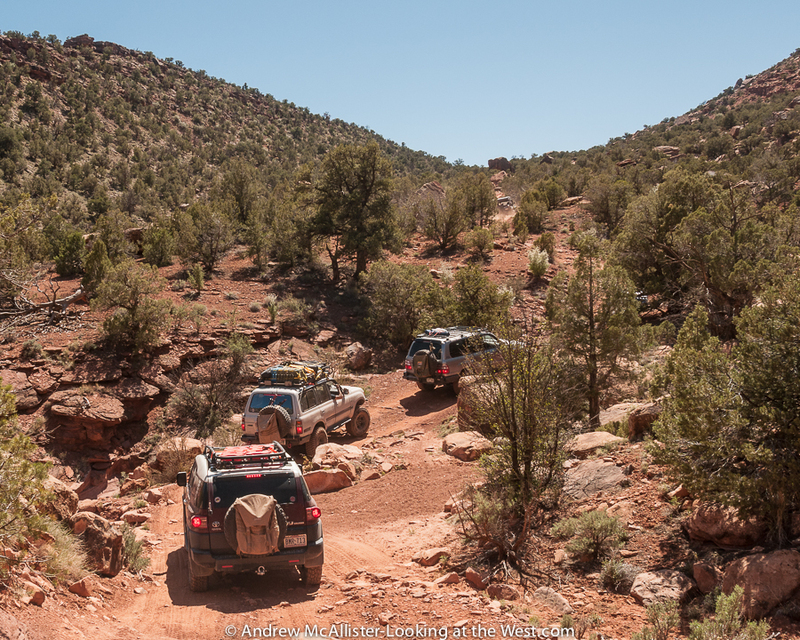 This last section of this trail was pretty dusty and our groups vehicles spaced out for safe driving. 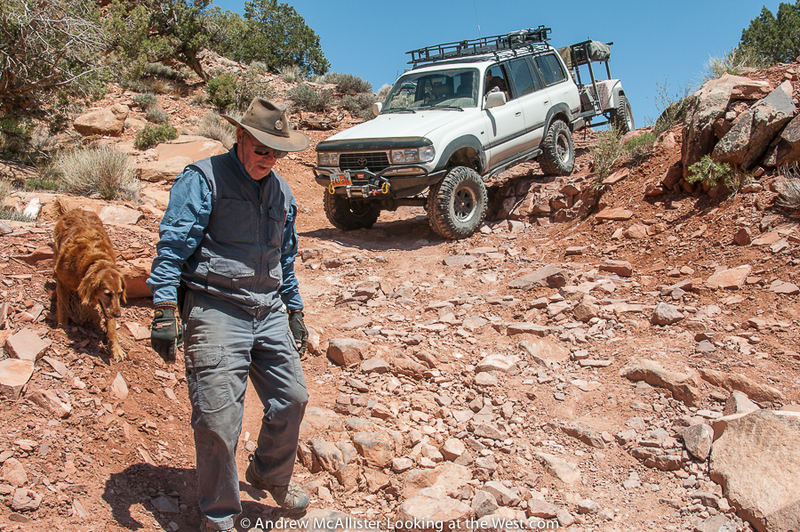 Below a member of our group waits for the last vehicle as we turn onto Utah Scenic 128 and head toward Owl Draw. The helicopter was just flying by. Utah Scenic Route 128 connects I-70 and 191 and follows the Colorado River through Professor Valley and well worth the trip. 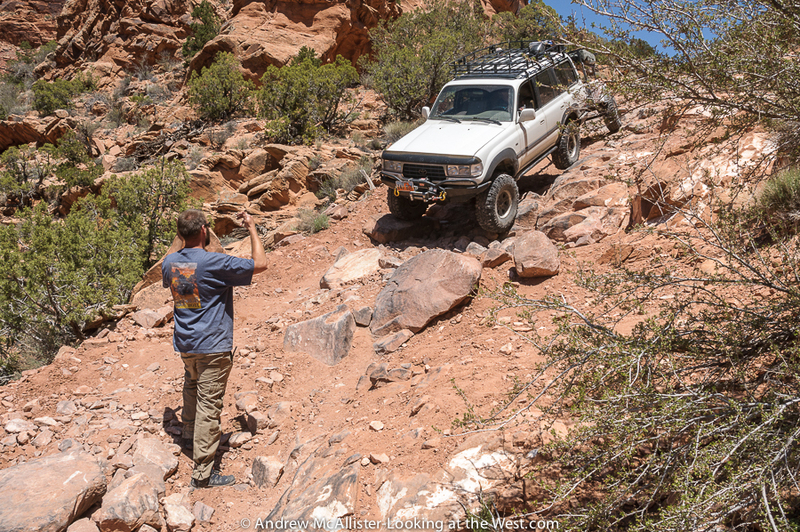 Owl Draw is a 4×4 road that starts near Gordon Ranch just as 128 closes in on the Colorado River. Above is looking North towards the East Tavaputs Plateau. After some time we made a quick stop at a scenic overlook to stretch the legs and grab a photo and we were off again. 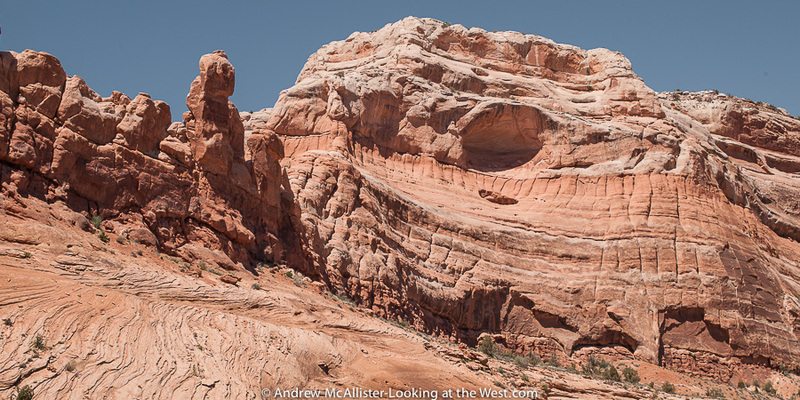 Interesting to see how the wind is sculpting these sandstone cliffs and the effects of water drainage on the soil. 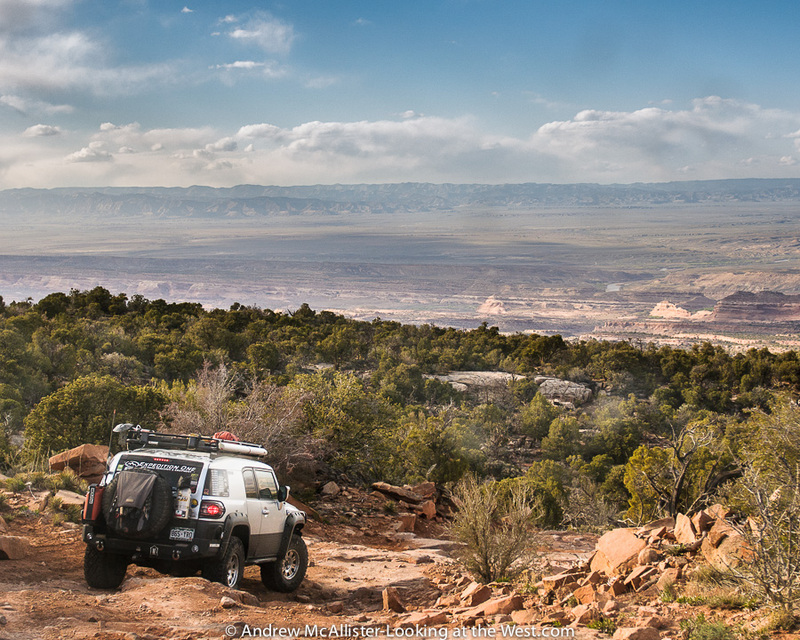 We welcomed the long sandy stretches of road and breathtaking views as we headed toward the river crossing at Dewey. Close to the trails end our group passed through a gate with a nice view of the Colorado River and the crossing at Dewey. There are two bridges at Dewey. The original wood plank bridge burned in 2008 and there is a local effort to restore it. 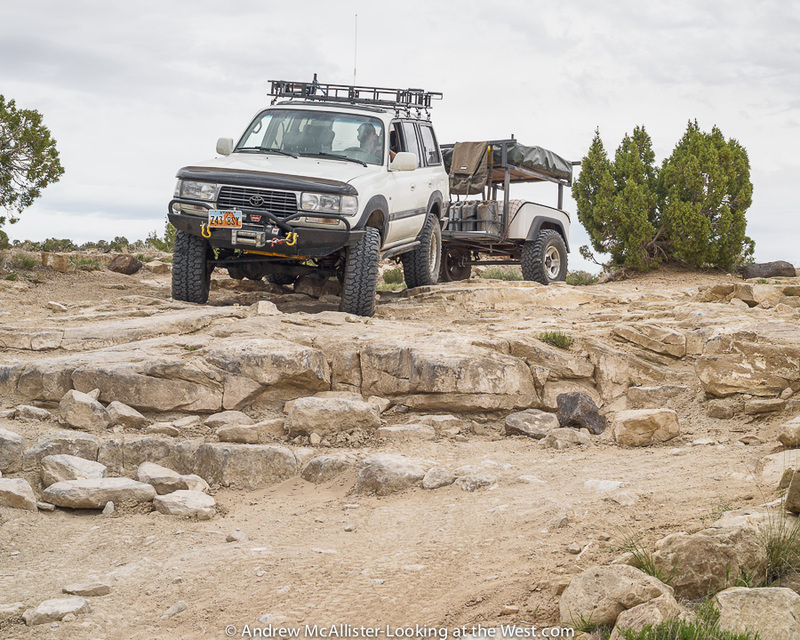 Our group would meet up at the old bridge foundation and then head to our campsite near the Delores River where we would have lunch and drop trailers before heading to the Top of the World trail. Note the tilted angle of the earth’s crust. 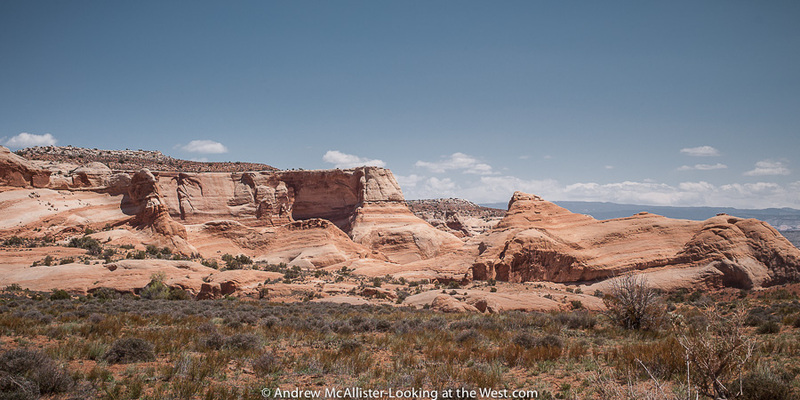 Below: sandstone cliffs and domes near Utah Scenic 128. Ace from the Book Cliffs Cruisers leads the charge as we start the Top of the World Trail. Guide books state that this trail takes about 3 to 4 hours to complete and we were starting after lunch so we had to make good time when we could if we were to make it back to camp before dark. The first five miles were graded dirt road and have plenty to stop and look at if you get an early start. The picture above shows the start of the trail. The rock steps above would eventually turn into proper ledges as seen below at the first obstacle point. 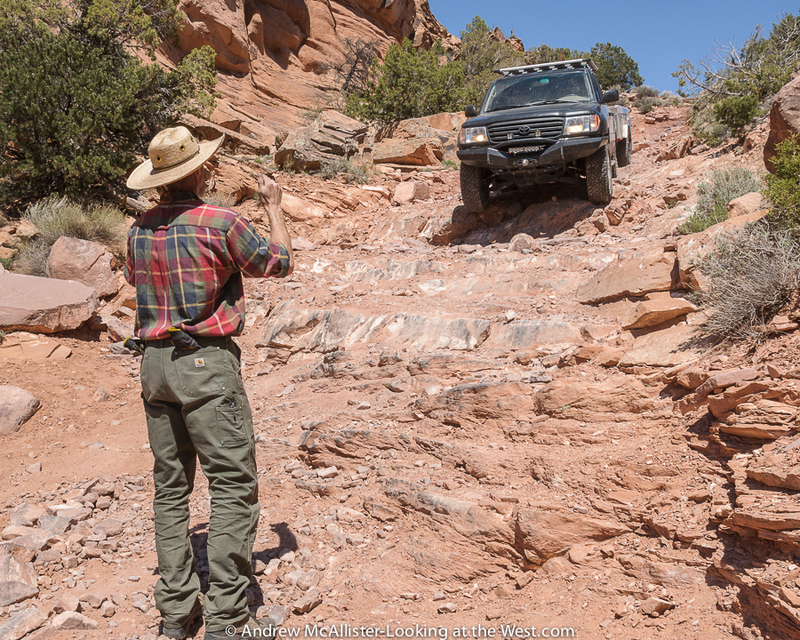 The Fun-treks guide book mentioned that this trail has gotten more difficult and once was doable in an aggressive stock vehicle. This would be my first time on a “Difficult” rated trail. 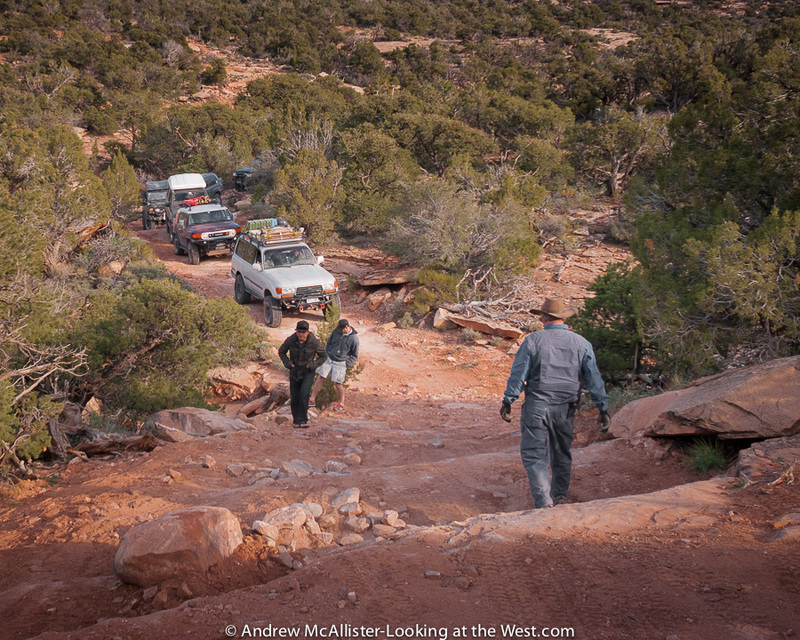 Above: Drivers assess the first major obstacle and plan a route. 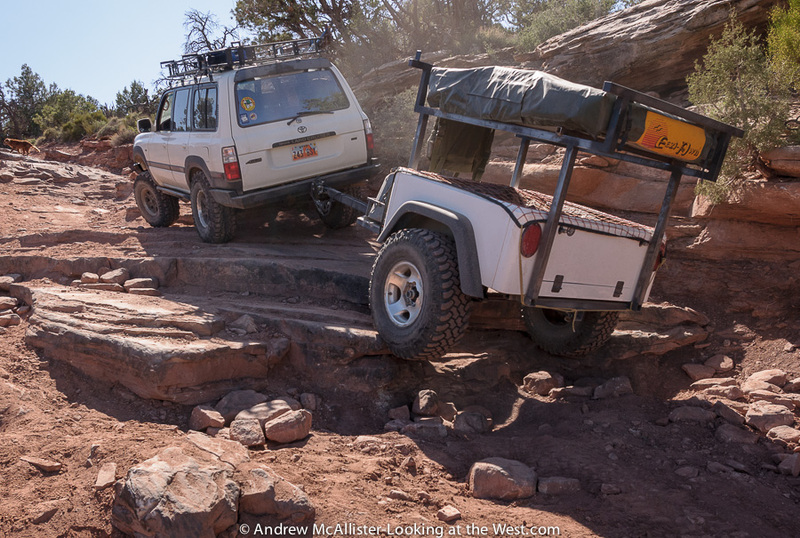 Below: With a good line and all lockers engaged Sean’s 80 series Landcruiser clears the ledge and pulls a trailer up it too. Since he was writing a review on the build and trail handling he opted to bring it while the others left their trailers at the campsite. 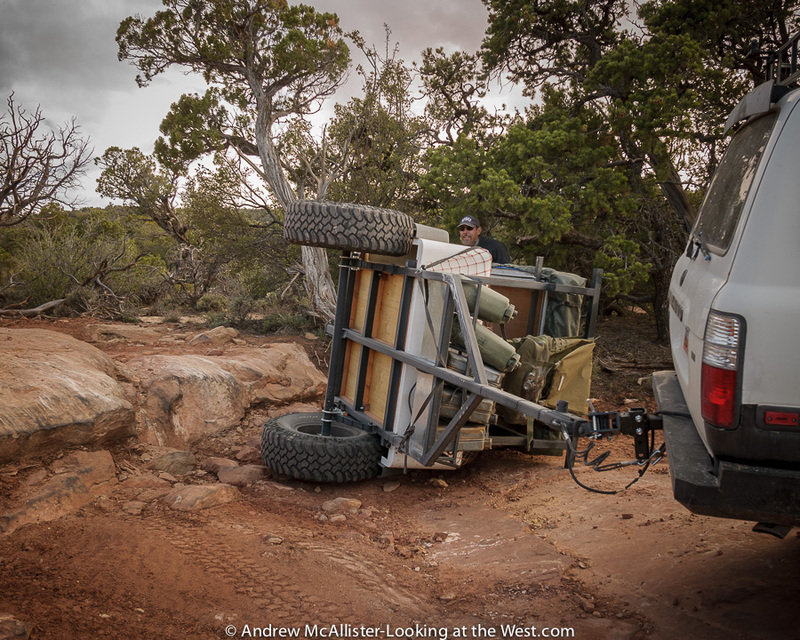 Below: Richard takes a line more suited for the FJ-40’s shorter wheelbase and clearance. Below: Darius looses traction on his first attempt but soon clears the ledge. 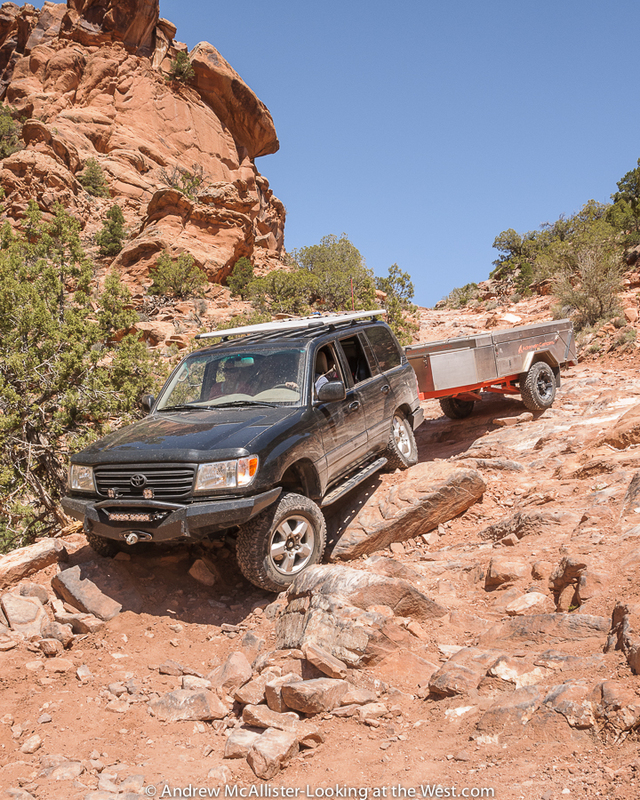 Below: Rocky sections test a vehicles articulation and the drivers ability to choose a line that considers the trailer as well as the tow vehicle. Passengers need to hold on… or get out and take pictures. Below: In the far distance is where we started from this morning. On this trail you do feel like you are going to the top of the world. The view from the top was nothing short of spectacular. When we arrived every one grabbed whatever camera they had and started snapping away. Being late afternoon the sun was harsh and hazy and I have had to spend some time in Adobe Lightroom to get the images to the state you see here. Above you can clearly see the windows section of Arches National Park. 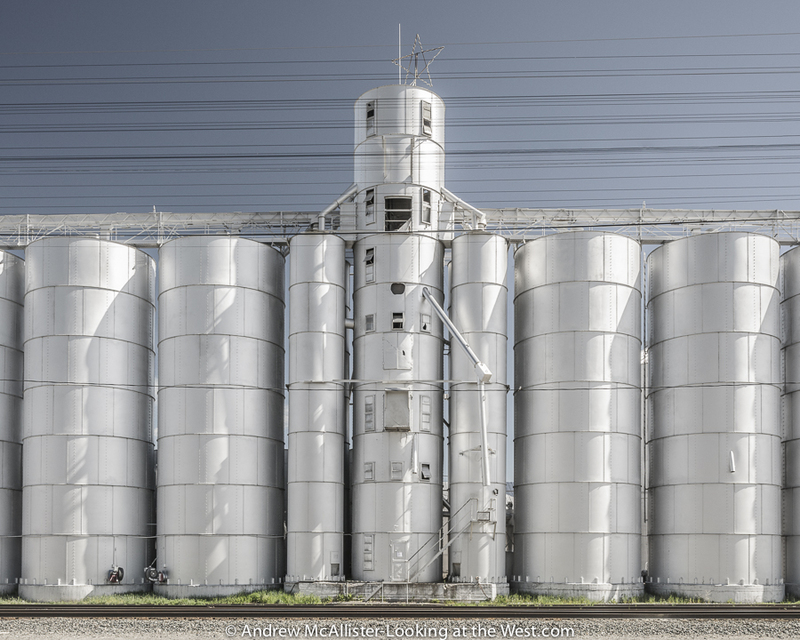 This is a great location that I’d love to photograph in first light. 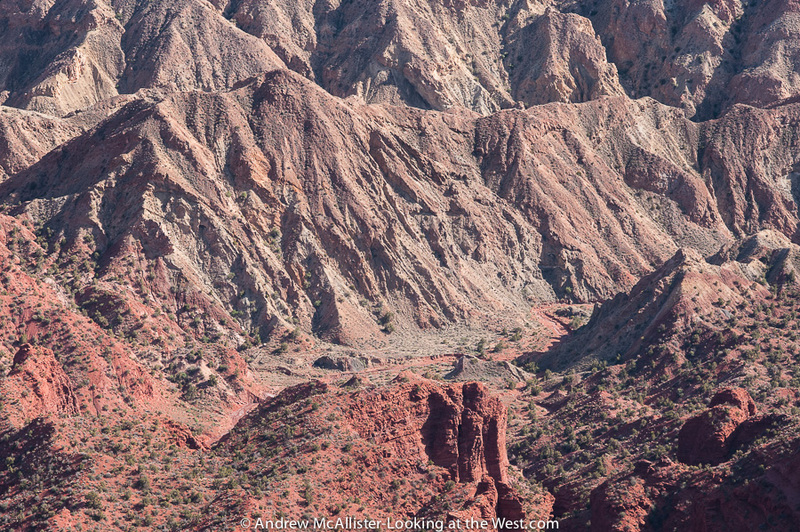 Above: Looking down on the backlit Fisher Towers and Onion Creek area of Professor Valley. Amazing view! Above: Looking North West toward The East Tavaputs Plateau. The haze and fact that I was using a longer focal length lens made this a hard shot to resolve but the view of over 30 miles was worth the effort. 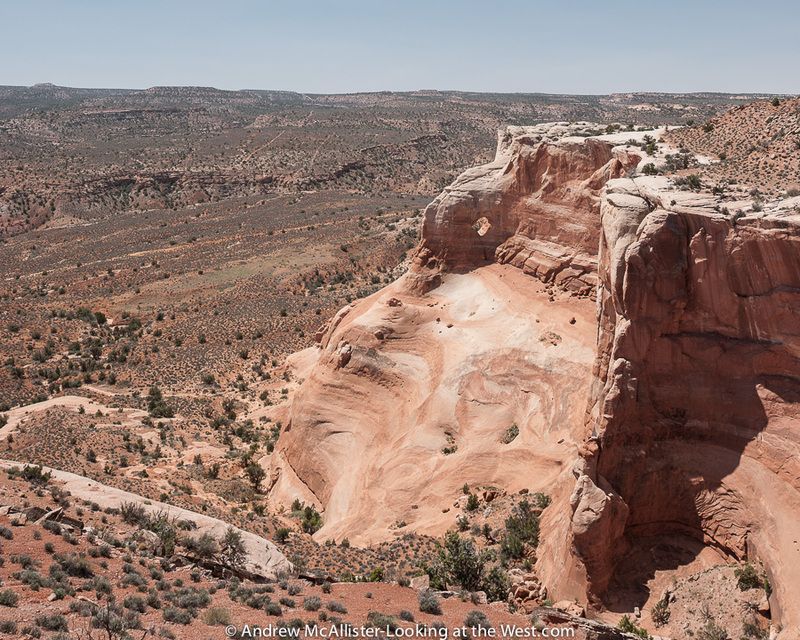 The sandstone cliffs in the mid ground are where we were a few hours earlier. I-70 is visible just below the center on the left side. The overhang at Top of the World is a great photo op. Google it and you find tons of shots just like this. Sean however was not aware of the over hang and was surprised when he saw the picture. Above: Richard and Kim on top of the FJ-40, on Top of the World with dog co-pilot Shamrock. Above: Should you look down you will see Onion Creek and to the East: Fisher Valley pictured below. Below: After the photo ops we needed to get going as we still had a difficult trail between us and camp. A few people received phone calls at the top but cell reception would fade fast as we started back down the trail. Ace again leads the way. 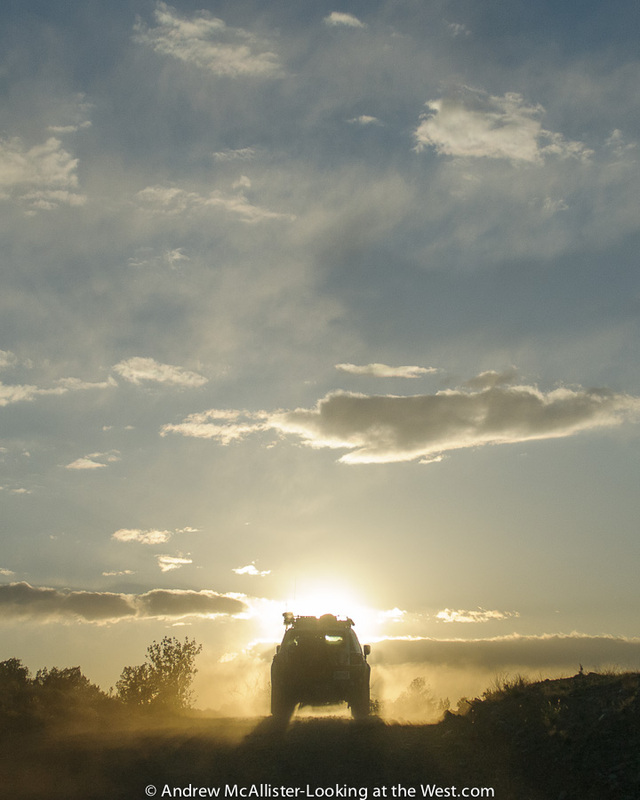 With the sun getting lower on the horizon and progress to be made I had to make the most of shooting from the Landcruiser. 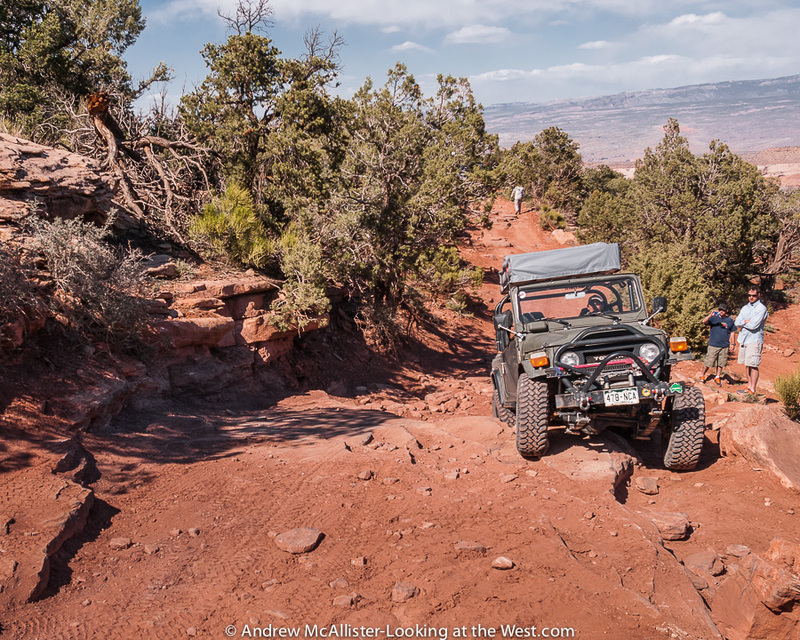 The shot above is through the windshield and below at a turn in the trail. Not bad if I do say so myself. 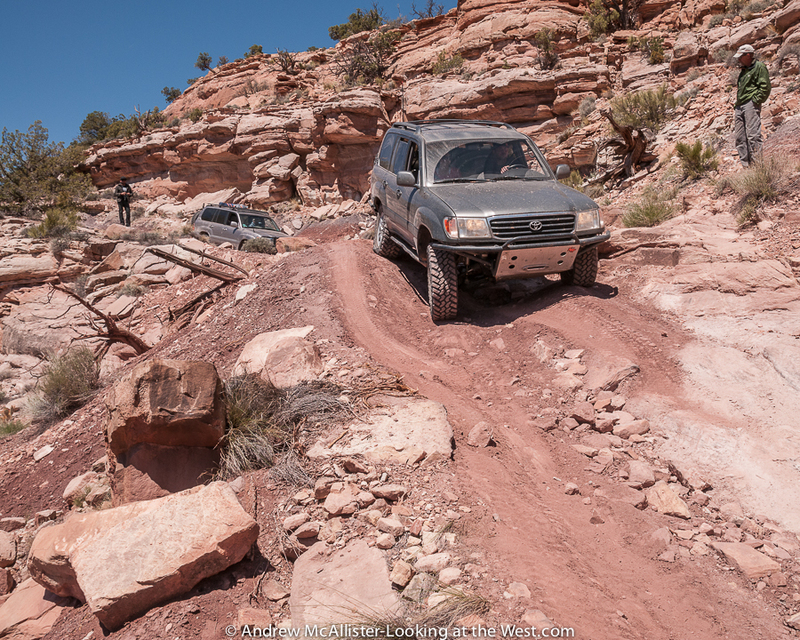 After a brief section of trail we came to a series of ledges that would challenge the Landcruisers with longer wheelbases. The ledges were covered with sand and spaced so that both front and rear wheels would be climbing up at the same time. Below: A tight section of trail forced me to use the widest lens I had available to illustrate the spacing of the ledges. After this shot I switched to the other side of the trail and a safer position. Below: Driver error caused our trailer to flip when stepping off this ledge. It was quickly righted with a couple of extra hands. 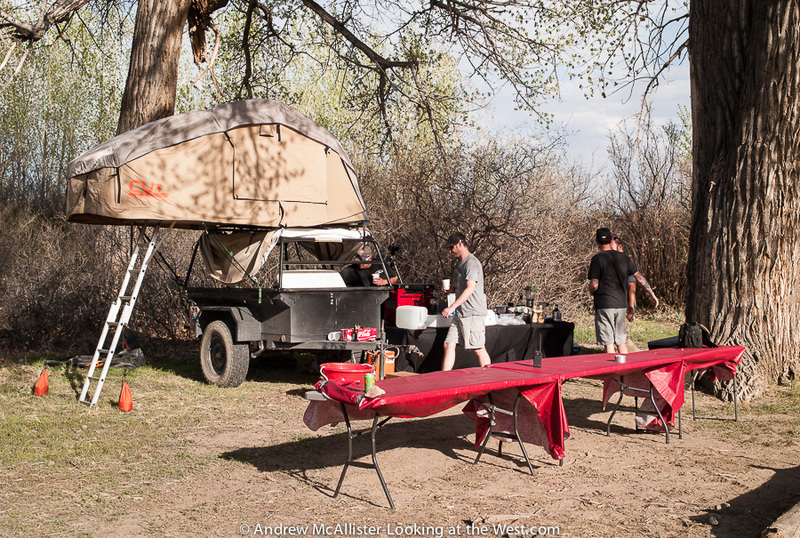 As you can see the ledge has a high side and the trailer is top heavy with the tent configured the way it is. Sean writes about this incident in his review. 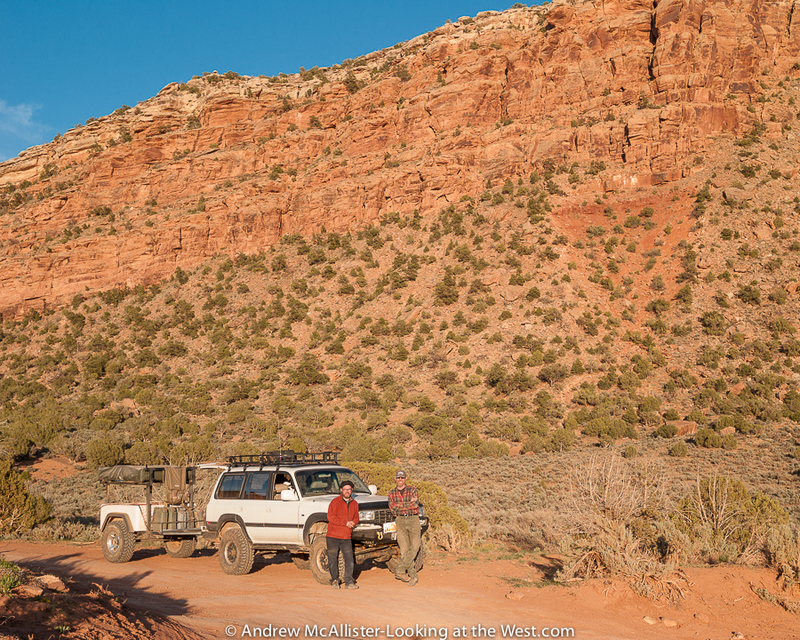 As soon as the trailer was ready to go our group progressed and we were on the main graded road before dark. 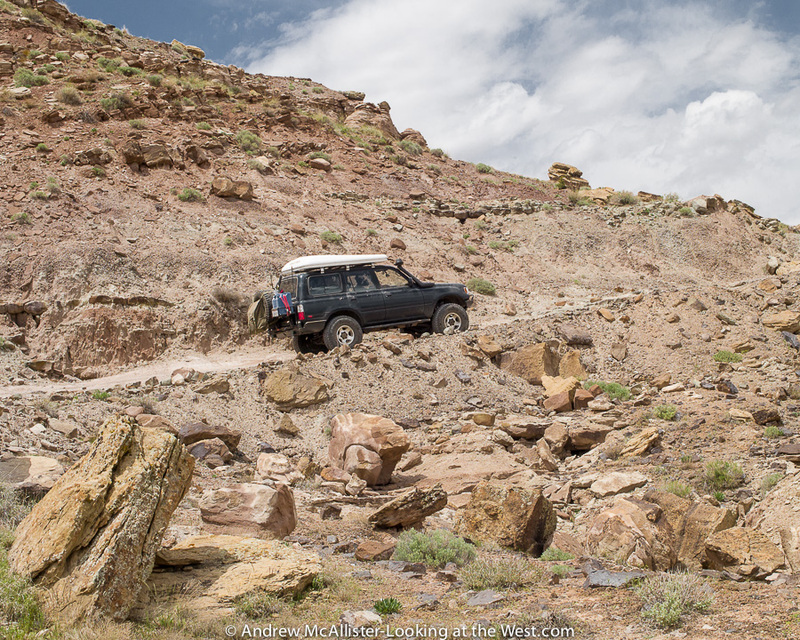 Below: Joe steps his Landcruiser down one of the many ledges on the return from Top of the World. Long day in the saddle was the correct way to put it. It was twilight when we got to camp. Everyone hustled to get tents setup before it was completely dark and with no dedicated camp chef tonight we would be on our own for dinner. After dark we gathered around the campfire and recalled the days events and planned for tomorrows adventure on Rose Garden Hill. After an hour or so I decided to call it day and head to bed. The days trek was pretty intense and I was ready for some sleep. Hopefully the winds would not keep me awake tonight as they did the night before. 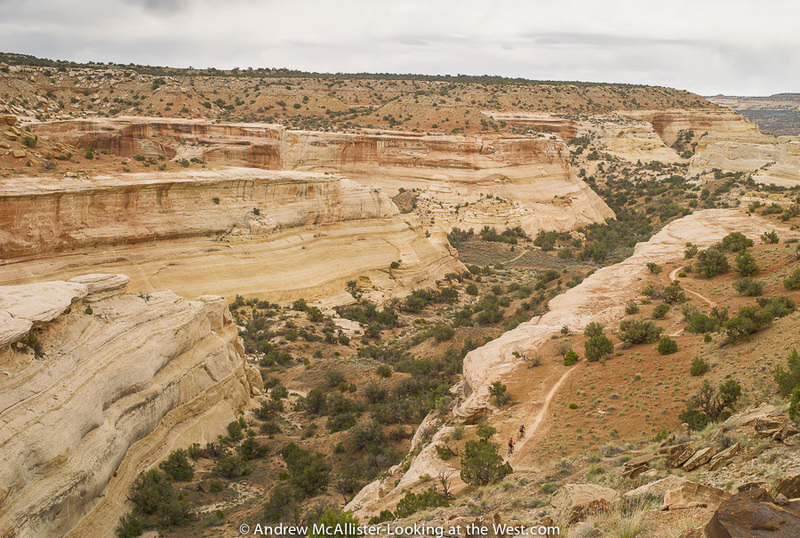 This past spring (2013) I had the opportunity to travel a section of the Kokopelli Trail. 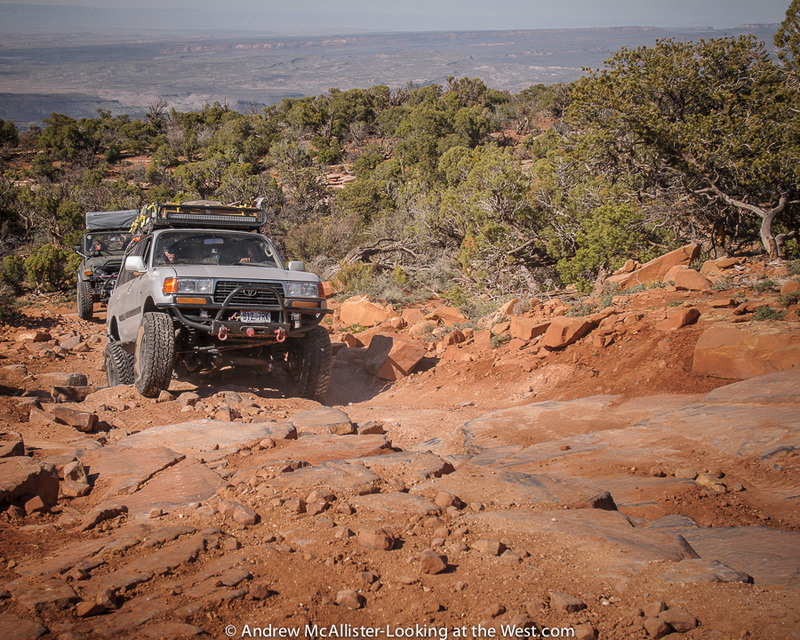 My friend Sean had procured a spot on the trail pre-run for Cruise Moab, a gathering of Toyota Landcruiser owners and enthusiasts. In addition to sharing fuel costs and serving as co-pilot I would take pictures for a review article on a small kit trailer called the Dinoot that is perfect for what the company calls trailer supported adventure. Sean’s review of the Dinoot trailer build can be found at Off-Road.com This trail run would be a 100 mile 3 day off road adventure through new ground that neither of us had traveled before. 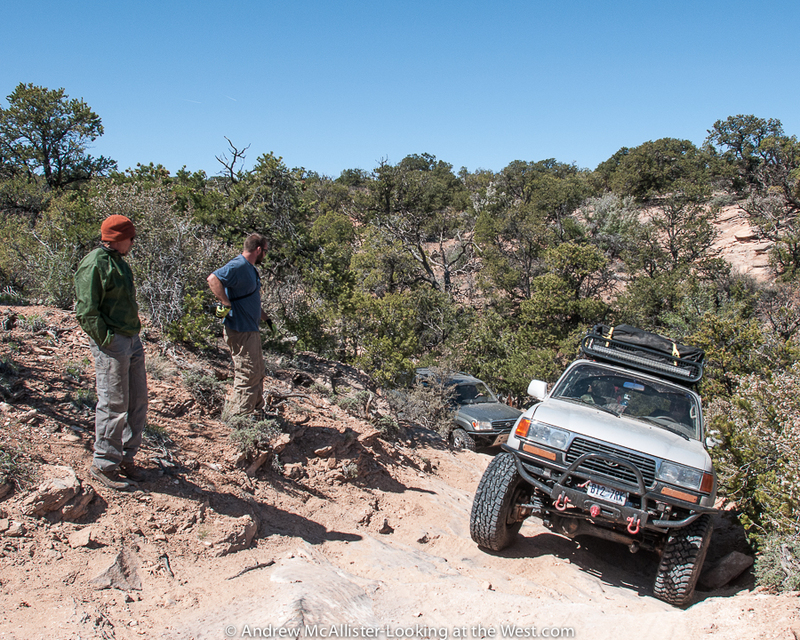 We would be guided by Jonathan and Ace of the Book Cliff Cruisers, a club based in Grand Junction Colorado. 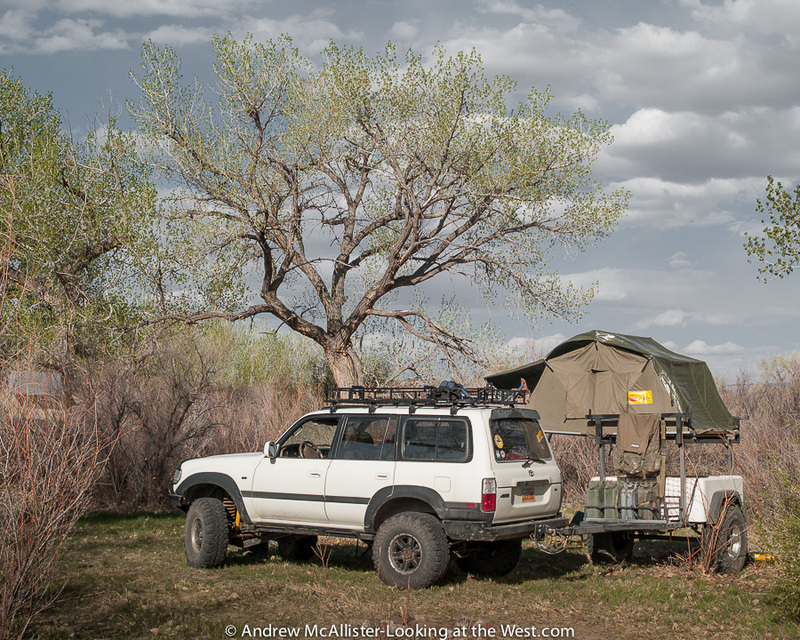 I charged up camera batteries, packed a tripod, clothes, and my camp box (tools etc.) borrowed a tent and sleeping bag from friends as this was my first camping trip in about 20 years. After an overnight drive we arrived in Rabbit Valley Colorado near the Utah border. 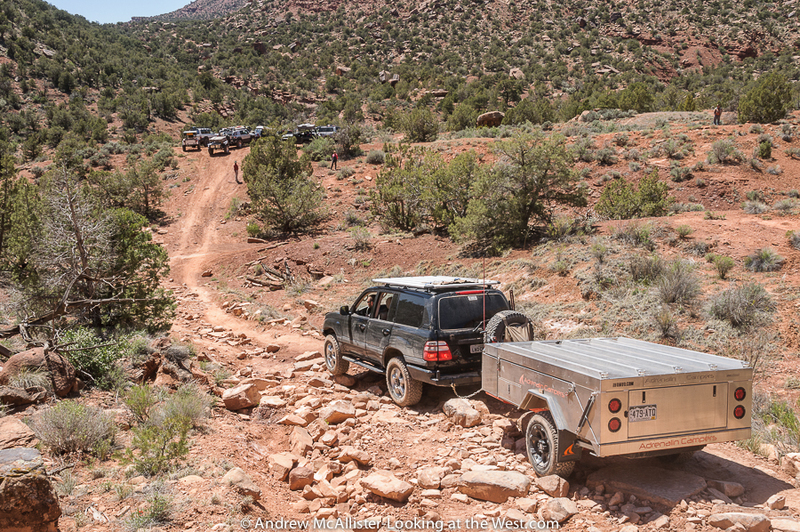 A campsite on BLM land was where we were to meet the other 9 LandCruisers we would be joining for the 3 day drive. Soon after we would start on our journey and I would gasp at the road conditions. Literally at the first bend in the road it was rocky with boulders and ruts. I was glad to be a rider in a very capable truck as we would encounter sections of road like this multiple times. 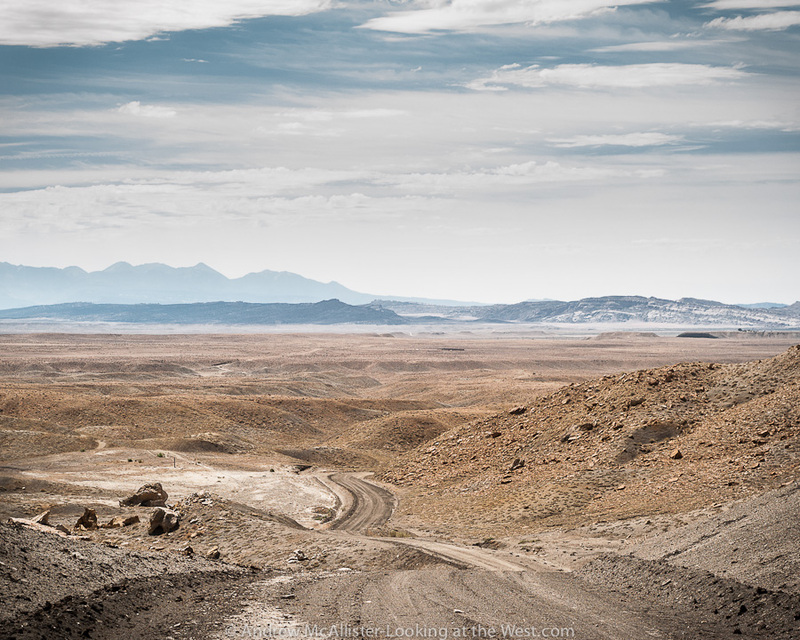 I was in new photographic territory too, how does one capture the intensity of a trail like this in a truthful way? What makes it interesting? How to get the best shot without holding up the group? The image above was from our first stop as a group about an hour into the drive. For a newcomer like myself I was really impressed with the terrain we were covering but this was our first real ledge. If my memory serves me it was a little less than 36″ drop total. A good line and a spotter would make it an easy drop for the group. How ledges like this work for clubs is a few people spot and take pictures wile the group slowly moves through the obstacle. After the whole group has passed the obstacle we move on. 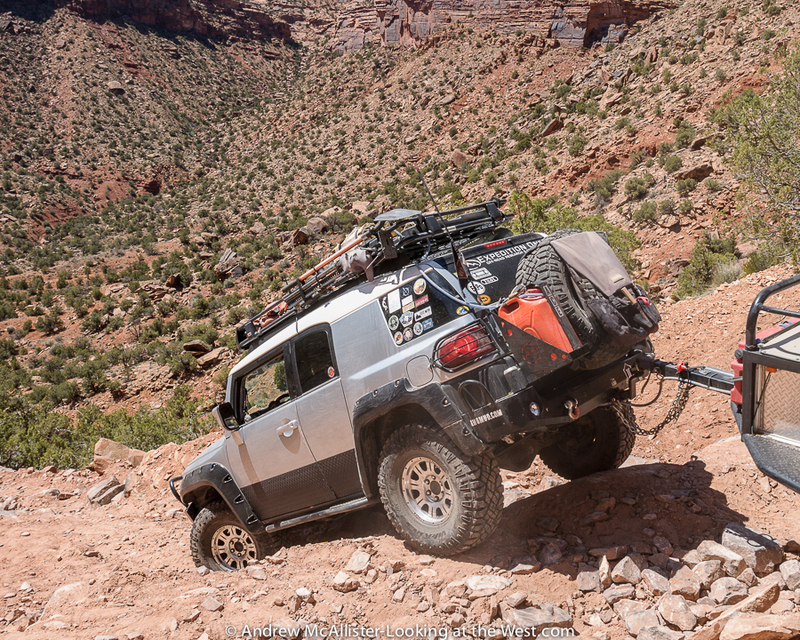 I would not attempt this in my stock Xterra… yet. A short distance later we came across some motorcyclists on the trail. At times like this I would analyze the scene as fast as possible and if there was a picture to be had I would tell Sean to stop and I would open the door and stand up to to get the shot. With everyone else still in motion it had to happen fast. 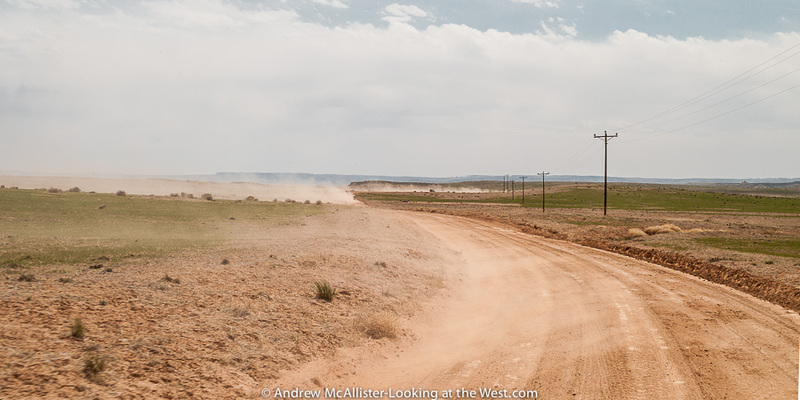 We would not encounter another set of motorcyclists the whole day. 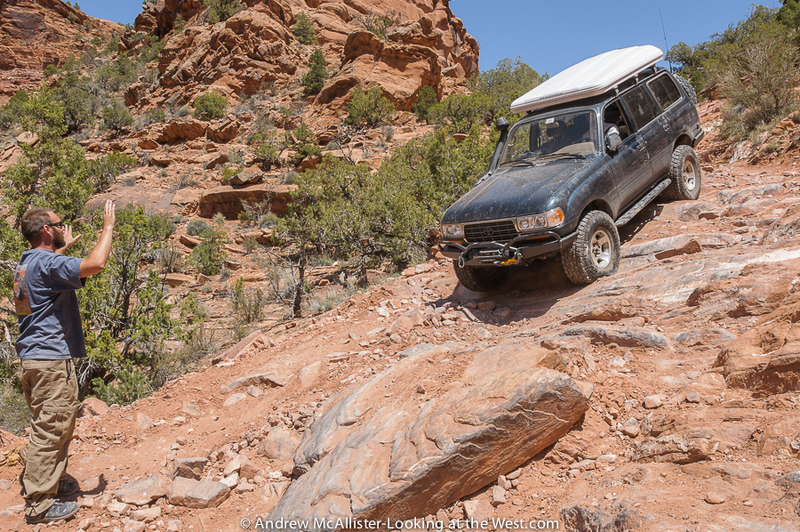 Crossing a boulder field a driver in our group snagged the sharp end of a rock and sliced his tire sidewall. Other drivers jumped in to assist in the wheel change and in short time we were rolling again. Funny how both guys helping are in flip flops. 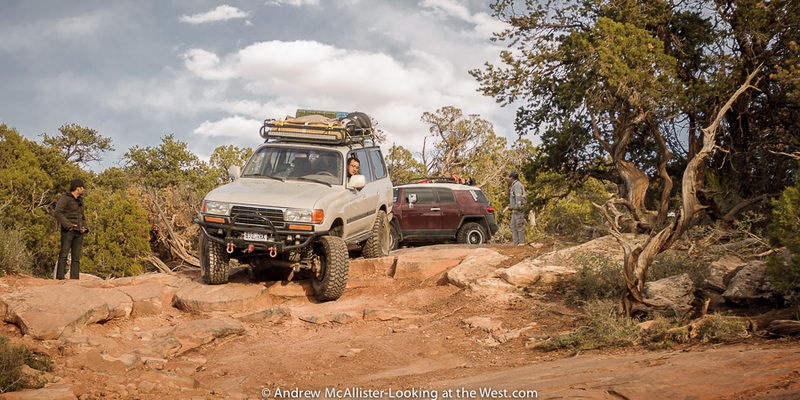 A great thing about traveling in a group like this is that there was plenty of knowledge and more than a few spare parts around and everything was Landcruiser centric. During our pitstop I had time to shoot a few landscape scenes. 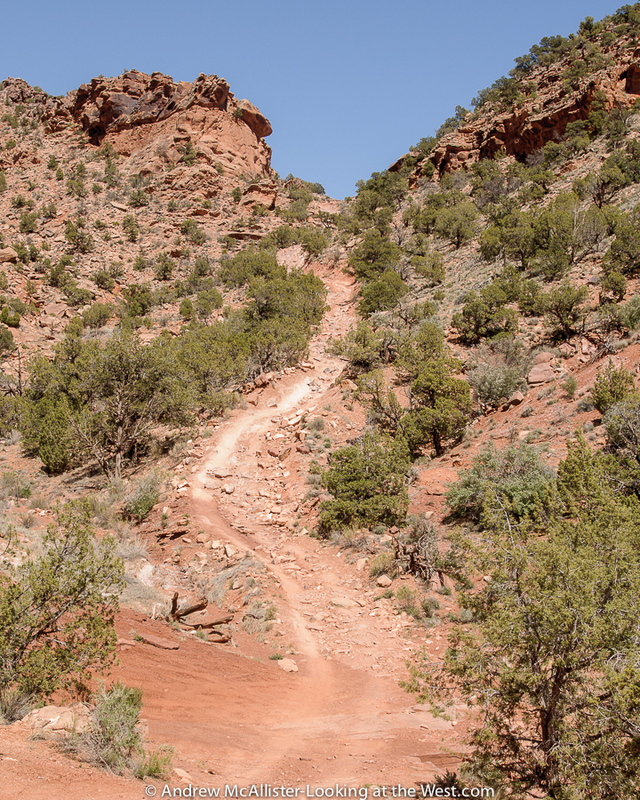 The Kokopelli Trail is used by used by 4-wheel drive vehicles, motorcycles, mountain bikes and the occasional atv. Everyone we came across was friendly, respectful and staying on the trail. 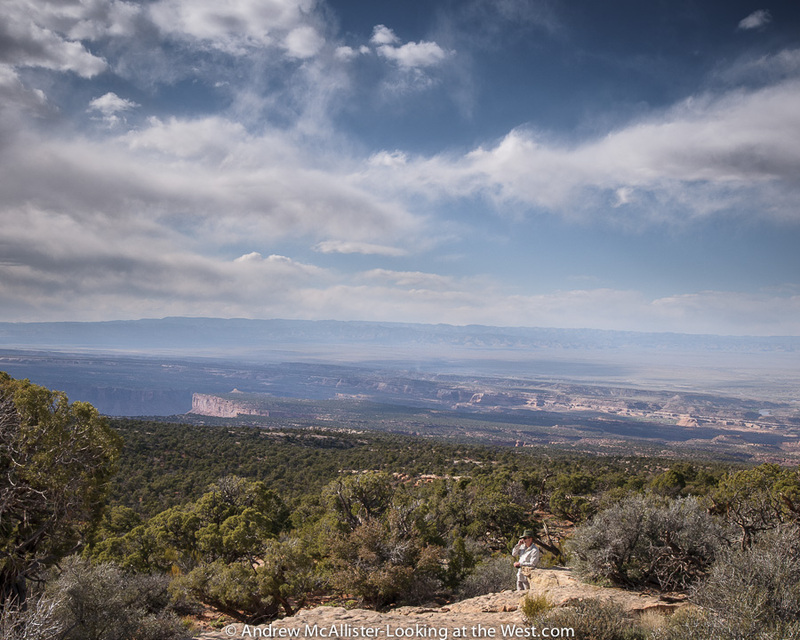 We would meet up with the mountain bikers in the picture above a little later and it turned out that they were attending Cruise Moab too. After a break for lunch we traveled through many washes of Bitter Creek. This section of the trail had some grazing areas where we came across sheep and cattle. I’d like to travel this section again some time as there are a few good areas for photography. 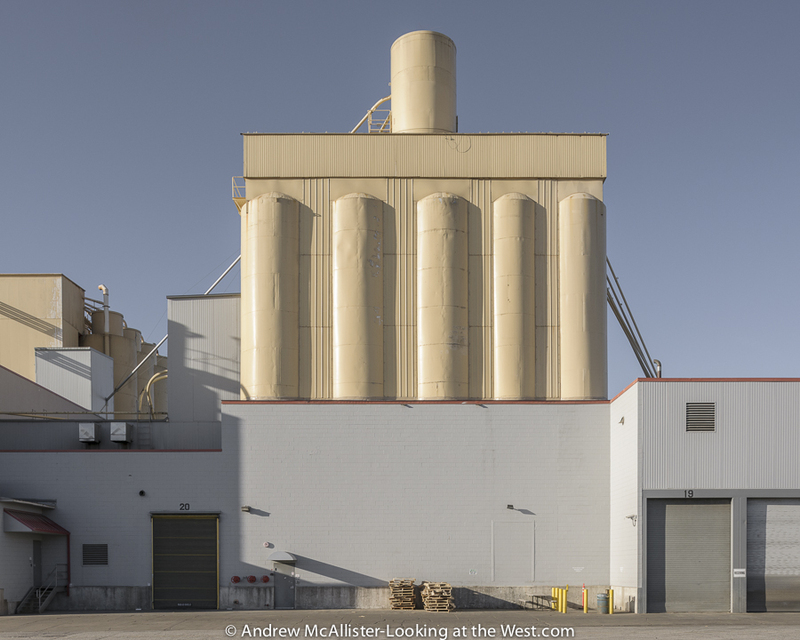 Both Sean and myself considered this trip reconnaissance and location scouting for future trips. Sometime in the future I like to have a truck like the 80 series Landcruiser above. 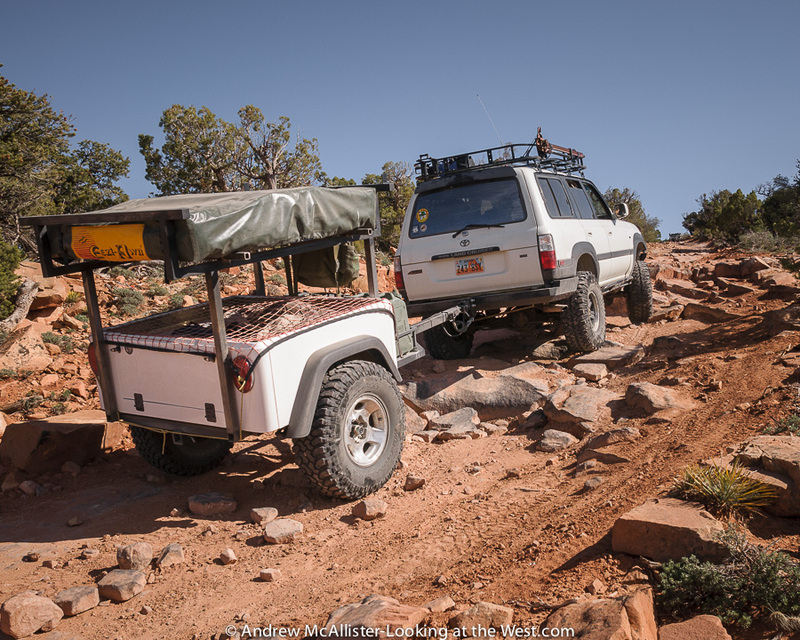 A highly capable off road vehicle with sleeping quarters on the roof, cooking ability, food storage via onboard fridge and most importantly driving and navigation skills to get there and back safely. A sharp bend in the road and how the caravan was spaced out made this shot possible. Climbing out of the Bitter Creek area and heading toward Coal Draw. This was an easy section thus I was able to get a sharp picture through the windshield. Most of the way up it was rocky enough that I had to hold on as the cab rocked back and forth. In a group like this you can watch how the vehicle in front of you tracks through the terrain but it’s important to keep in mind how your truck is different. In our case we were pulling a trailer and our line would need to consider how it tracked around obstacles. 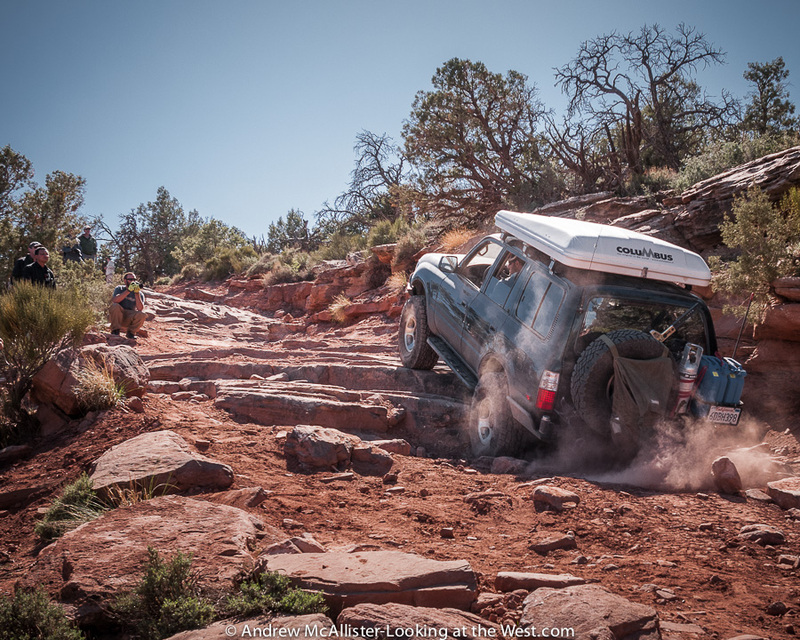 Other things to consider would be wheelbase and lift (clearance), though all the trucks in our group were similar, it is often not the case. View from the top looking North East toward Colorado. Note the communications tower on the ridge. From this point onward the trail became less and less rugged until finally we reached pavement and enjoyed a few minutes of smooth road. Soon we would turn onto Route 179 and head to our next destination, Cisco Landing for a restroom break and the final leg of trail for day 1. 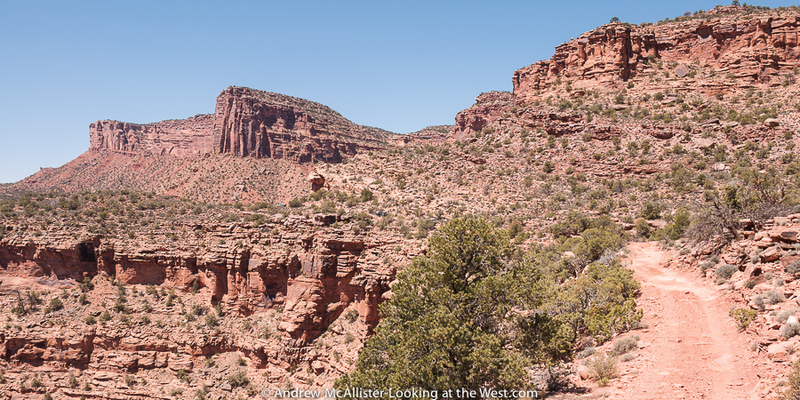 After a quick stop at the Cisco Landing (pictured above) we headed to Fish Ford, a campground near the Colorado River. As it was early in the season the trees had just started to get their leaves and the overall feel was harsh. Thus not many photos of the camping area. The group spread out around the area and made camp. It was nice to be done with the driving and have some time to walk around. It was a bit windy and I was a little nervous about my first night camping in 20 years to be next to a Cottonwood tree. I set up the borrowed tent as close to the truck as possible thinking it would shield me from wind and falling branches. Pretty silly in retrospect. Naturally it rained that night and I awoke many times thinking I heard animals outside of my tent. The morning revealed no evidence of the large grazing animals that I could swear were just outside my tent all night. There are many advantages of traveling in a group, safety in numbers, sharing of resources, camaraderie among others. Getting going in the morning, that would be a disadvantage. Once I’m awake I want to get going, make the coffee, pack up and get on with it. With a large group it takes a while just to get everyone up and ready, then there is breakfast and breaking camp. We are talking about a multi hour process here. Not unenjoyable but different than my daily ritual. As a group of strangers camping together for the first time we did a decent job of getting on the trail at a reasonable time. A bonus of this trail run was having a dedicated camp chef for the first day and a half who would cook the group a great camp dinner that night and breakfast the next morning. Being that I had been awake the better part of 40 hours and was hanging out with people I just met I did not go into photography mode at dinner time. I did not know if I would even publish a story on the trip. Learning this blogging thing as I go I realize that a group shot or establishing photos of the group would help put things in context. Instead I have the above shot of the cooking and dining area. Far from a great record of the event you will have to trust me that the food and the conversation were a great way to end the day. Many lively conversations continued late into the night, however once the sun set I was ready for sleep and the end of an adventurous day. 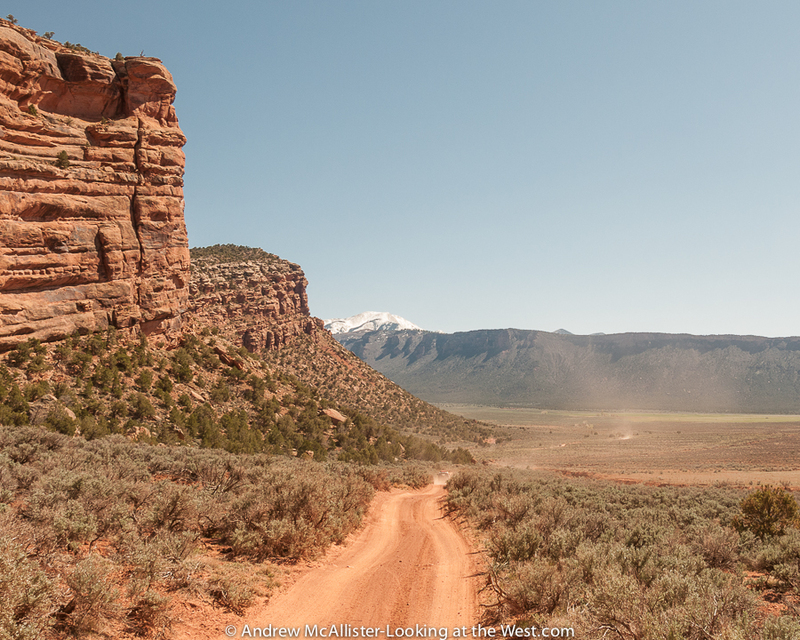 Happy to announce that my image of Thompson Pass looking toward Moab was used as the cover image to a great new book published by The University of Utah Press. 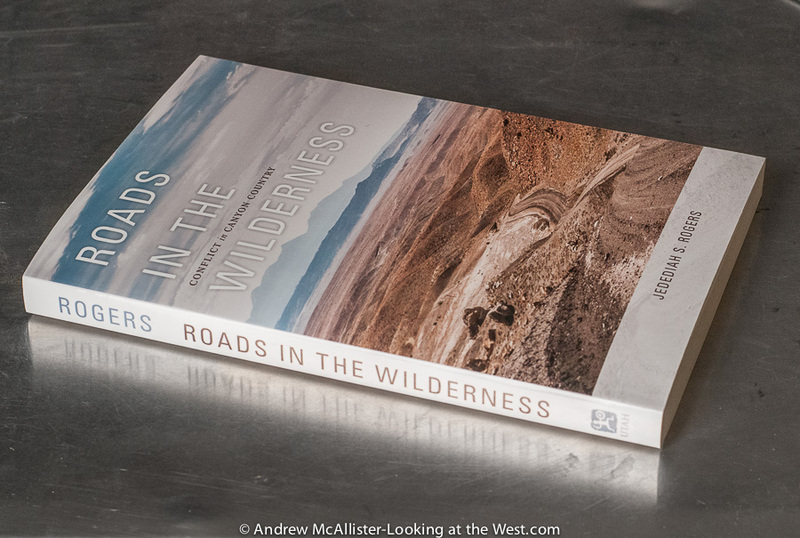 The book is Roads in the Wilderness Conflict in Canyon Country by Jedediah S. Rogers who is the winner of the Wallace Stegner Prize in American Environmental or Western History. It can be ordered through Amazon and University of Utah Press. Over the Holidays I had time to read it and found it very enlightening. For example I had no idea how deeply entrenched differing views of the landscape are and how roads play directly into those views. 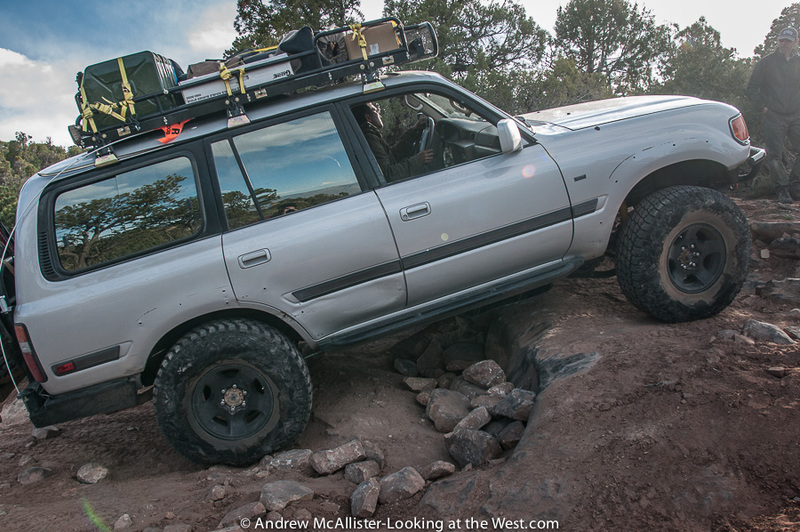 As a new westerner (from Ohio) and avid vehicle based explorer I found Roads in the Wilderness to be welcome change from the trail guides I read on the area. After reading Jedediah Rogers book I have a deeper understanding of how the roads came to be, what they represent to various parties in Southern Utah. I can highly recommend this book to fellow explorers of southern Utah. I am grateful to have one of my images grace the cover of this fine book.